From a conservation point of view this species is regarded as not being threatened. 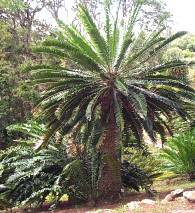 The Modjadji cycad is native to South Africa, occurring in the Letaba District of Mpumalanga at an altitude of 600-1 000 m. A rainfall greater than 1 500 mm a year is experienced in the region, with frequent mists providing cool, humid summers. The region is frost-free. This species was described in 1926. The Rain Queens (Modjadji) of the Lovedu region have protected this locally common species for centuries. The specific name transvenosus refers to the network of veins which can be seen when a leaf is held up against the light. This species is closely related to E. paucidentatus ; however, it can be easily identified as its leaflets are broader than those of E. paucidentatus. 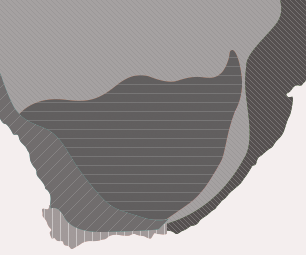 The genus is restricted to Africa and consists of approximately 69 species. Porcupines are known to ring-bark cycads in some areas and, if accessible, the cones are destroyed by the porcupines when they strip the cones of their succulent cone scales. Baboons occassionally break off the immature cones. The Leopard Magpie moth larva is capable of destroying the newly sprouted leaves of a cycad. Certain seed-eating snout beetles, of which there are a number of species, can in the case of a heavy infestation, destroy an entire seed crop. The attractive, brightly coloured seeds attract squirrels, baboons, monkeys and dassies. Some birds such as louries, parrots and trumpeter hornbills are also attracted to the seeds. Only the soft tissue covering the seed is eaten and the kernel is then discarded. 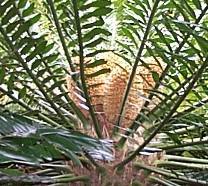 In the past, the pith from the stem of cycads was removed, then enclosed in an animal skin, fermented and ground into a meal which was used to make bread, hence the Afrikaans name broodboom = bread tree. Cycads develop into attractive feature plants and E. transvenosus is a particularly attractive species, provided it has sufficient space and ideal growing conditions. 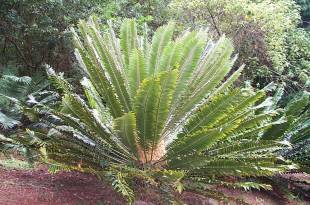 This species is one of the most attractive of the larger cycad species and responds well to cultivation in frost-free areas, with regular watering in the dry months. Good drainage is essential and protection from sun in very hot areas will help to prevent the leaves from burning. Adapts well to full sun or light shade and prefers a sheltered position providing protection from the prevailing winds. When young they can be grown as a container plant and eventually transplanted into the garden. This species transplants easily as a mature plant, although it is recommended to remove all the leaves before doing so. 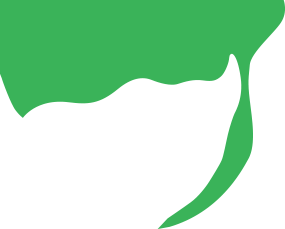 This makes for easier handling and the plant will recover sooner due to less moisture loss. Irrigation systems can be detrimental to cycads, damaging the leaves and stems from the pressure of the water as well as over-watering. Giddy, C. 1978. 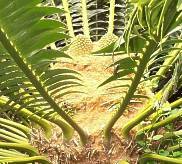 Cycads of South Africa. Struik, Cape Town.